I just wanted to share some scriptures that I have collected that give insight on who God is. He is so amazing and we should always take time to bask in that truth. (Psalms 33:6) By the word of the LORD were the heavens made; and all the host of them by the breath of his mouth. (2 Chronicles 16:9) “For the eyes of the LORD run to and fro throughout the whole earth, to shew himself strong in the behalf of them whose heart is perfect toward him. (Deuteronomy 32:39) See now that I, even I, am he, and there is no god with me: I kill, and I make alive; I wound, and I heal: neither is there any that can deliver out of my hand. I heard this sermon entitled “You are the temple of the living God” by Pastor Mike Hoggard and I thought it was interesting and wanted to share it. In the sermon, he compares our body to the actual temple of God, showing that God designed us with His temple in mind. First, he mentioned how the Bible is constructed. The Bible has a total of 66 books, 39 in the old and 27 in the new. The Bible has a spine and the spine holds everything together. Our backbone has 33 bones, starting from neck to tail. The right side of our body has 33 nerve bundles and the left side of our body has 33 nerve bundles. The whole body has a total of 66 nerve bundles. He also mentioned Jesus was the age of 33 when He died. The number 33 is significant. Numbers represent the order of God Himself. The throne of God is your heart and the heart has 4 chambers which represent the four beast that holds up the throne and the sea of glass is the pericardium, a fluid-filled sac around the heart. Ribs surround the heart which represents the 24 elders clothed in white, our ribs are white. The heart operates through electricity which represents the lightning and sounds like thunderings. Our voice box is close to the lungs and heart and it represents the voices. Our right lung has 3 sections called lobes, the left lung has 2 sections, and 2 trachea which equals 7, this represents the 7 lamps of fire burning before the throne which are the 7 Spirits of God. I wanted to share an email he received about how cool the Bible is. John 1:1-5 uses exactly 66 words to describe Jesus. And the Bible has 66 books which is the word of God. That is very cool. I have read a awesome book about advancing GOD’s Kingdom. 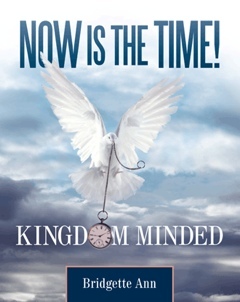 The book is titled Now Is The Time! Kingdom Minded by Bridgette Ann. The book reveals vital information through the word of God and the importance and urgency of the “Kingdom” which is the ministry of Jesus and how we as believers are to live and function in the earth realm. There are chapters which focus on the Kingdom including; how to have a Kingdom Mind-Set, understanding the Kingdom-Connectors (five-fold ascension gifts), realizing your role as a Kingdom Carrier, submitting to your Kingdom Assignment, and utilizing Kingdom Wealth to serve and bless others. The revelation of God’s word will ultimately change your life and perspective on how you look at the “Kingdom” after reading this teaching tool. Jesus is coming back for his bride the church. Are you saved! Are you ready!